Learn about how we can create a unique space with a décor treatment that reinforces the theme of your event. The same stunning elements of our tenting are also available to decorate virtually any space. Match your backyard to our tent, or simply transform the pool area into a Moroccan cabana lounge. Possibilities are endless, lets talk more about how we can help. 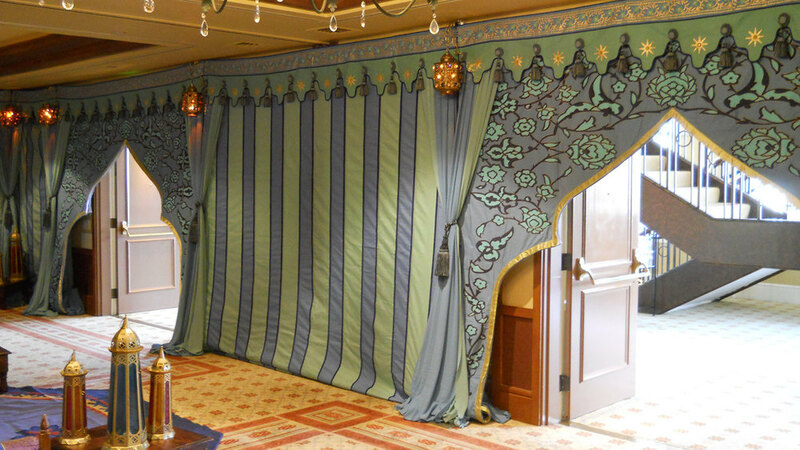 There are many ways Raj Tents' fabulous inventory can be used to enhance and transform spaces. From patio makeovers and pool house decor treatments to Indian wedding reception stage decoration, there are lots of possibilities to bring in color and style. In southern California, pool houses and cabanas can become veritable palaces with Moroccan style decor, or accentuate the Spanish Colonial architecture with Hollywood Glam decor. Drape and lighting treatments of Mexican Tiki huts or Tiki bars works a treat too and are among our favorite beach wedding decor ideas. For wedding ceremonies in temples and churches, some well placed decor can make a big difference to everyone's experience. For Decor Treatments at home, often Moroccan style decor works best, being a perennial favorite and generally fitting in with the aesthetic of many larger homes. Pipe and drape wall treatments allow us to decorate most spaces and ceiling treatments are also an option where there are sufficient rigging points.